Click HERE to view our current sponsors! Join us for an enjoyable Sunday morning Minyan for the whole family. Bring the children! Breakfast will be served following services. Dates: First Sunday of each month - March 5, April 2, May 7, June 4, July 2, August 6, Sept 3, Oct 1, Nov 5, Dec 3. 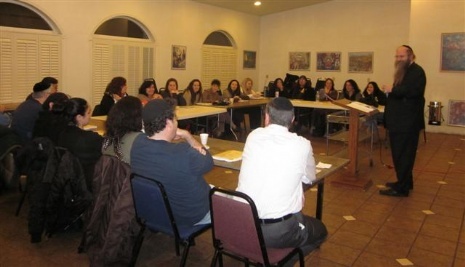 As with all of the Chabad of WMC’s programs, The Adult Education is funded by members of the local community. Please consider supporting this worthy cause click here and specify that the donation is for Adult Education. Thank you to our ongoing monthly sponsors who are partnering with us in making the adult education at the Chabad House the success that it is. May Hashem bless you with much success! We are so convinced of the high quality, scholarship and meaningful experience of our courses, we guarantee your satisfaction. If after taking the course you are not 100% satisfied, please let us know and we will make it right. If you have any questions about our classes call Rabbi Levi Wolosow at the Chabad of Western Monmouth County, 26 Wickatunk Road, Manalapan @ 732-972-3687.